A large rustic village house, dating from the 17th Century, renovated to the highest standard, with luxurious facilities and large private infinity swimming pool. 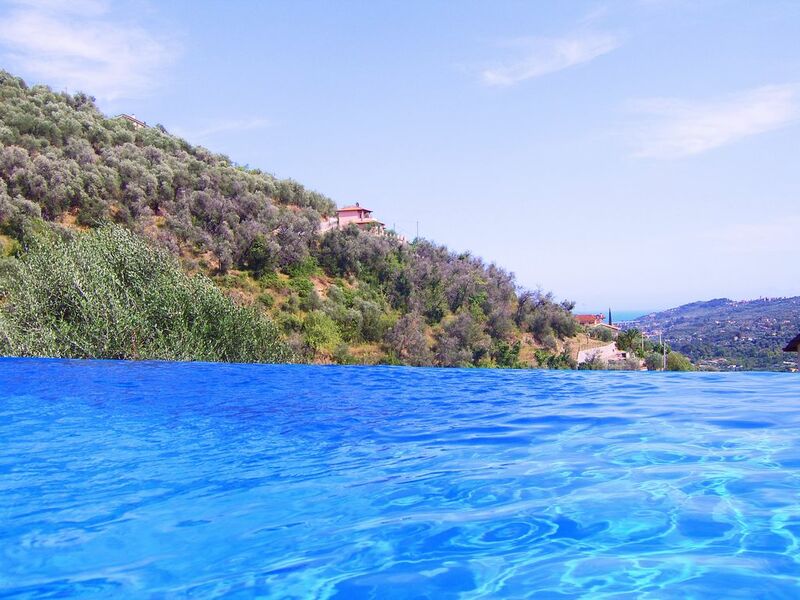 The property boasts fantastic panoramic views over green olive valleys down to the sea. Facilities include fast (30mb) WiFi broadband internet access, 2 Apple iMac computers, HD Satellite UK and European channels, home cinema system with Apple TV film library and film rental, washing machine, dish washer, alfresco dining area, full gamesroom with full size American Pool table, large screen HD Satellite TV, Wii games console, and classic pub video game table with Jukebox faciliy. A Private garage is available for guest use, luxury sunbeds, roof terrace with amazing views, and a full landscaped terraced garden. The garden has a child safe gated lower terrace with Playground including playhouse, slide and climbing wall. A high chair, cot and stair gates provided. NEW: All bedrooms have independent HD Satellite UK and European TV. Four luxury bedrooms, 2 doubles and 2 twins sleeping up to 8 adults. 3 bathrooms including Jacuzzi plus poolside toilet/changing room & shower. There is an additional bed available on request for the larger twin room, ideal for children sharing the room. *** New *** All bedrooms have their own HD Satellite TV allowing independent viewing of UK and European television in each guest room. The ancient village of Dolcedo is within walking distance with restaurants, shops, bank, chemist etc. The beach is 10 mins drive from Dolcedo, as is the town of Imperia and a large supermarket. Airports: Nice is technically the nearest airport - just over an hours drive. Genoa (Genova) airport is also very close - 1.5 hours drive. Turin airport is also within easy reach at approximately 2.5 hours drive. The swimming pool is a salt water pool (only a tenth as salty as the sea!) which generates its own chlorine as needed, hence having a much lower chlorine level than normal pools. On reacting with bacteria the chlorine turns back to salt. The pool is therefore ecologically friendly, and is far better in smell, taste and on the eyes than a normal chlorine pool. The pool is large (4.5m by 11.5m) - 1m deep in the shallow end and 1.8m in the deep end. A diving board enhances the pool. The pool is located on the top terrace to benefit from the panoramic views. Luxury sunbeds and and bar tables are also provided, and there is a toilet/changing room and outside shower, plus shade offered by olive trees. The mid terrace is landscaped with fruit trees etc. An alfresco dining area in shade of olive trees and BBQ area are located on the child friendly lower terrace (fenced/gates on exits) with Children's Playground and access to house. Games Room and Comfortable Lounge: A luxury games room including a high quality full size American Pool table, Electronic Darts, 2 player cocktail style arcade game featuring around 100 favorite games including Space Invaders, Galaxians, Pacman etc. and a Jukebox facility, plus a Nintendo Wii games console with many games. In addition, there is comfortable seating, large screen HD satellite TV (European and UK), plus beer/wine fridge. The light and airy main lounge includes large high definition (fullHD) screen, UK (FreeSat including BBC 1 HD, BBC 2 HD,BBC News HD, ITV HD and channel 4 HD services) and European satellite (Hotbird and Astra 2) with the possibility to record programmes for later viewing, home cinema system Apple TV system with a film and music library and the possibility to rent the latest films. The lounge also has board games, comfortable sofas, ambient lighting and access to the kitchen and dining room and garden. This level also contains 2 large screen iMac computers with high speed broadband internet access. The internet is also accessable via WiFi on all floors if guests wish to use their own laptops, iPhones etc. Baby Sitting service can be arranged subject to availability. All bathrooms have luxury fittings and appliances. The largest bathroom has double basins and a hairdryer, plus a double jacuzzi bath and a separate shower enclosure. Another bathroom shared by the twin rooms has views to the sea and contains a washing machine for guest use. The smallest bathroom is en-suite to one of the double bedrooms. All bathrooms have shower cubicles, basins and storage in addition to the other facilities. The fourth bathroom is outside, near to the pool and also doubles as a poolside changing room. comfortable lounge with real fireplace and excellent tv/audio facilities. fridge/freezer, oven, large gas hob, microwave, toaster, kettle, blender, hand mixer, scales, contact grill, dishwasher, washing machine. large inside dining area, plus large outdoor alfresco dining table. Full size 9ft America Pool Table, wii, arcade table, beer fridge and satellite TV. Apple TV with many available songs. Apple TV with many purchases films for free viewing, including children's films. Possibility to rent latest films. The property is located in a small rural village called Dolcedo, with views of the Mediterranean Sea through green & silver olive tree lined valleys. There are a selection of excellent local restaurants, a bank and shops. The beach and Imperia town are 10 minutes drive. San remo 20 mins, Montecarlo 45 mins. The nearest airports are Nice and Genoa each are just over an hours drive away. Turin airport is just over 2 hours. There are beautiful mountain walks and drives and the area is very popular with skiers, cyclists and golfers. The food and wine of the region are superb - second to none. Tranquiliy, luxury and perfection with all the required facilities at hand.